Looks smart, works well and good value. Quite a prominent logo - asides from that it's great. 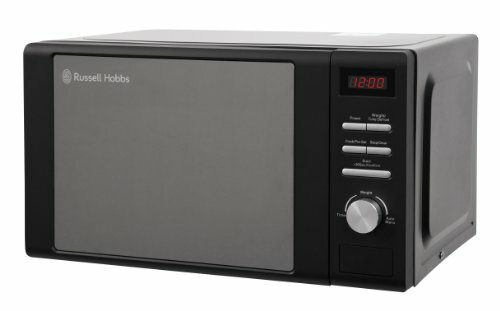 Featuring a black exterior and mirrored door, the RHM2064MB from Russell Hobbs is an entry level solo microwave featuring 5 different power levels. Maximum power output is 800w, as is typical for microwaves in this price range. The exterior measures 44.6cm by 27.0cm by 33.2cm and overall weight is 10.2kg. The buttons are very clearly labelled, in an easy to read font, which is a refreshing change, and as such this microwave is very easy to operate - no symbols to decipher. Likewise the clock and digital display is clear and easy to read. The black finish looks smart, and our test team were positive about this model's aesthetics. As with most models, the turntable is glass and removable for easy cleaning. 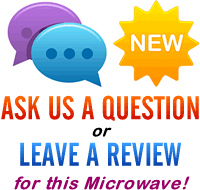 Overall we were impressed with this model's performance - it heated and cooked fast, and past experience of Russell Hobbs microwaves suggest that it will be reliable. The RHM2064MB is a solid 20 litre solo microwave - for the money it offers reliability and very good value.